The number one region in Italy, after seeing the art cities of Rome, Florence and Venice, is Tuscany. Unfortunately, many first time travelers plan a vacation, that has them scurrying about at high speeds, and which includes stops that are to distant from each other. If you are only going to Italy once in your life, then by all means, cram it all into one trip. However, for your Tuscany vacation, I suggest that you do it the Italian way, and take your time, relax, and explore where you are. There will be plenty to see and to do, while in the region of Tuscany, without ever leaving it. Try to plan to only visit one region at a time, or to limit yourself to two regions at most, which are adjacent to each other. Tuscany is a logical starting point for your trip, with many well known sites found within her boundaries; Florence, Siena, Lucca, Garfagnana, Pisa, Cortona, Chianti Region, San Gimignano, Montalcino and Montepulciano. You can easily fly to the heart of Tuscany arriving by air to either Florence Peretola Airport or Pisa Galileo Galilei Airport. Arrival in Pisa is convenient for those who intend to travel by train, since there is a train station adjacent to the airport. Florence Peretola airport has a shuttle bus departing every hour which goes to the centro storico-historic center, and will leave you at Santa Maria Novella (SMN) train station. Tickets can be purchased at the “T” Tabacchi located in the arrivals area. Firenze is a good city in which to begin your visit to Toscana, for all the obvious reasons. It is easy for a non-Italian speaker to move about since everyone speaks English. At the beginning of your stay, I highly recommend a three hour walking tour of Florence with a licensed historic guide, to help you absorb the depth of history in this world class city. for a list of English speaking guides. The rates are established by the guide union, which assures you a standardized price. A must see in Tuscany is the city of Siena, the arch rival of Florence. 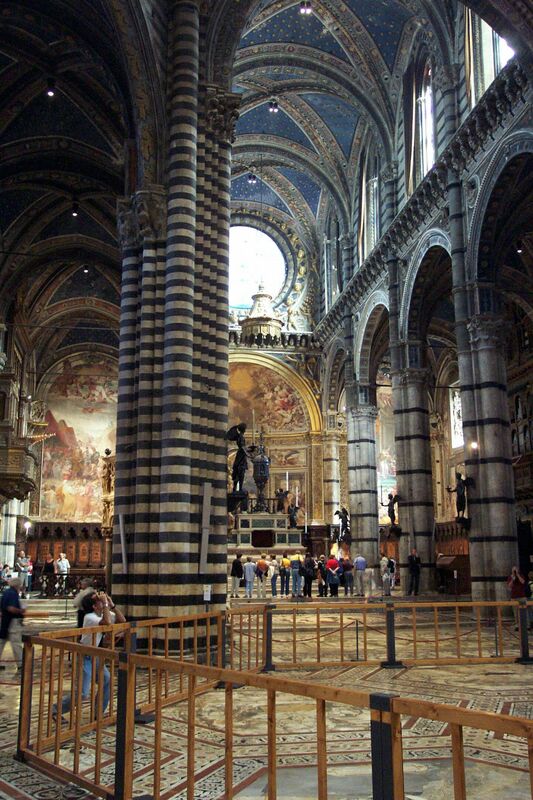 Siena is a showcase of Gothic Architecture. While visiting Siena, make sure to the pre- Renaissance paintings found in the Pinecoteca Nazionale, noted artists include Simone Martini, Duccio di Buoninsegna, Ambrogio e Pietro Lorenzetti, visit the Palazzo Pubblico Museo Civico. Another must see while in Siena is the Ospedale di Santa Maria della Scala, founded in the 9th C, the building dates from the 14thC, and is now a museum. In the entry, one can see fresco’s depicting the history of the hospital in the pilgrim’s hall that date from 1440. Siena is a sight to see, and one could easily spend hours just sitting in the shell shaped Gothic Piazza del Campo and be content watching the pigeons and tourists congregate. It is easiest to reach Siena by taking the bus- (yes I said bus), from Florence and which departs every hour from the bus terminal in Florence. The arrival point for the bus in Siena is at the church of San Domenici (d.1226), found in the quarter of the city known as terzo di Camollia, basically the center of town. The train, though more glamorous, has infrequent departures, and leaves you at Siena train station, inconveintly located a few kilometers from the city center, adding to your trip either a cab ride or electric bus back up to the city. The Chianti region, located south of Florence and north of Siena, is a charming area which not only produces great wines, but also has four wonderful hamlets to visit; Greve, Castellina in Chianti and Radda in Chianti and Gaiole. Not far from Castellina, is the walled fortress of Montereggioni constructed in the 13th c The fourteen towers are clearly visible from the autostrada, and were mentioned by Dantes’ in his Inferno in the11th canto. Montereggioni makes a great spot to stop for lunch; there is a wonderful trattoria Il Pozzo located within its walls. A wonderful five star hotel near Castelnuovo Berardegna is Hotel Fontanelle http://www.hotelfontanelle.com/ More economical is the four star http://www.vignale.it/ located in Radda in Chianti. Make sure to get a room in the main house with the terrace. Known as the city of towers, (there were once 72 of them,) only thirteen now remain, San Gimignano is a “must see” for the first time visitor. The church of the Collegiata contains a series of frescos (d.1333) representing the Life and Passion of Christ and the New Testament. be mindful when you dress if youwant to visit the collegiata. Do not show shoulders or knees please. Thogh security guards do have loaner fabric to offer those who forgot to bring a coer up. 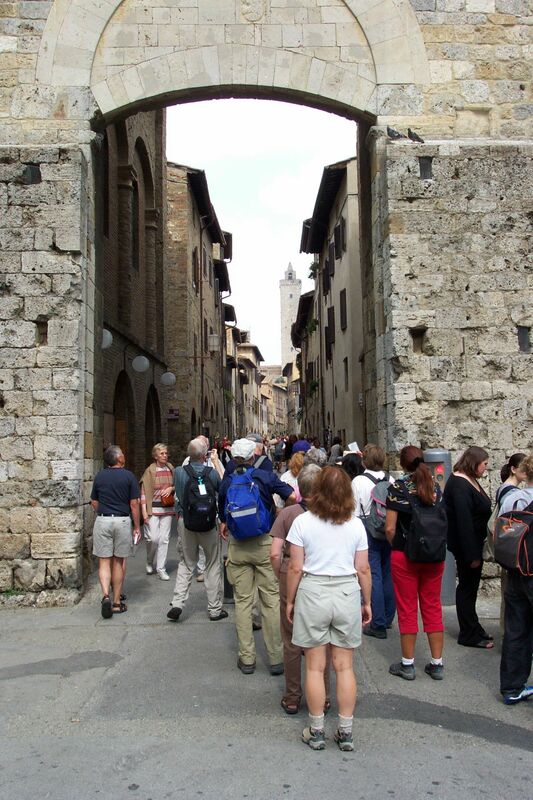 A word of caution about a day trip to San Gimignano; now overrun with hoards of stretch tour busses, and loads of day tripper tourists, San Gimignano requires a bit of strategic maneuvering in order to arrive. Compounding the crowding is the traffic produced by these tour busses which now must park over 2 kilometers away, and need a number to be called to pick up their passengers. Tip: Stay in San Gimignano overnight at three star La Cisterna, http://www.hotelcisterna.it/ or Bel Soggiorno www.hotelbelsoggiorno.it both located within the walls of the city, and you will be able to hear the bats wings whoomp as they flutter from tower to tower once the sun has set. Neither hotel is outstanding but you will be staying within the walls and will have the town to yourself when night falls. To the west of San Gimignano, is the quaint hamlet of Certaldo-Birthplace of Boccaccio, You can stay at th e simple romantic 8 room, Osteria Del Vicario www.osteriadelvicario.it. South of San Gimignano lays the mysterious hilltop town of Volterra, where Alabaster has been mined since Etruscan times. The Museo Guarnacci is also a stop worth making in Volterra for those appasionati -passionate of Etruscan artifacts. South of Siena is an area known as the Crete Senese; an austere land marked by dissolving clay cliffs, and doted with cypress trees. Vines do not grow in this arid landscape though two of the better known wine producing DOC towns Montepulciano and Montalcino sit on the fringe. In the center of the crete is the town of Pienza, birthplace of Eneas Silvius Piccolomini-Pope Pious II. For a day trip, visit Bagno Vignoni, Abbazia di Monte Oliveto Maggiore and Sant’Antimo, all worth the short drive. Located in the Val d’Orcia are numerous Tuscany farmhouses to stay in while you relax and enjoy your trip in all price points. 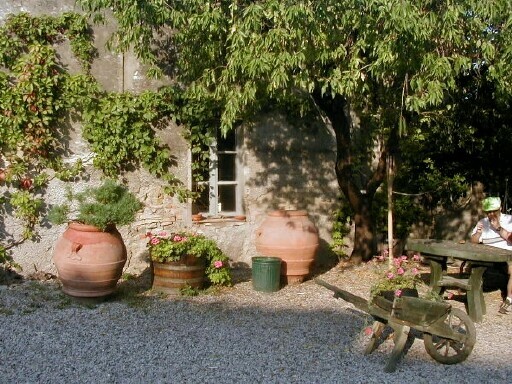 Near Montepulciano is Agriturismo www.dionora.it which offers a high caliber experience in a peaceful valley which compliments the landscape. Another option in the countryside not far from Pienza for those with an open wallet is L’Olmo www.olmopienza.it More simple accommodations can be had at Piccolo Hotel Le Valle www.piccolohotellavalle.it Located within walking distance from the center of Pienza Piccolo Hotel is a perfect bed and breakfast in Tuscany. Still further south in Toscana, is the town of Pitigliano, and her sister villages Sorano and Sovana. 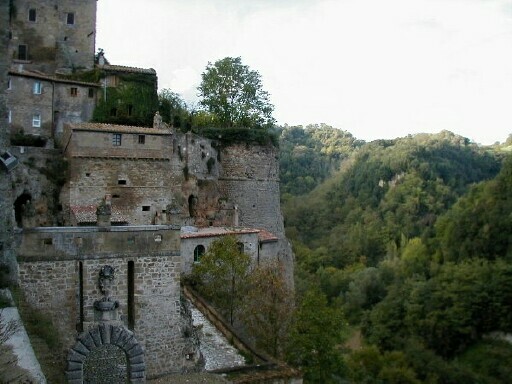 Pitigliano sits on a rocky spur of tufa stone and was originally inhabited by the Etruscans. All three villages are off the tourist path, that is, not within reach for tourists who travel by train, the towns all offer an escape from the crowds in the middle of an unspoiled countryside. And if you like what you’ve been reading, like us on Conde Nast Traveler’s Travel Specialists List, where I’ve appeared for the last three years straight.